What is Ad 2 Austin? An affiliate of the Austin Ad Fed and the American Advertising Federation (AAF), Ad 2 Austin is a community of advertising and marketing professionals, students, and enthusiasts ages 32 and under looking to progress their careers, share their knowledge, and have a damn good time meeting new people in the industry. We have new a lot of new members on our 2017-2018 board of directors, but we are still looking for a few committee co-chairs. Ad 2 Austin is all about supporting the local community, staying up with and learning industry trends, and inspiring and supporting one another. It’s a network of people who enjoy being a part of something big. A community that could be just a bit bigger and better with you! Take a look, and let us know if you see a fit! If so, drop us a line at president@ad2austin.com. Public Service: Each year, Ad 2 clubs nationwide partner with local nonprofits, and together they produce a (free!) advertising and marketing campaign. This committee basically runs like an advertising agency, offering marketing assistance, brand guidance, and social media management—just to name a few. It is a great opportunity to give back to the community and produce amazing, portfolio-worthy work. Membership: The Membership committee is in charge of recruiting new members and supporting current members. This is a very important role and provides the opportunity to network with various points of contact at local agencies. Sponsorship: Sponsorship is dedicated to finding annual and event-based sponsors to help fund the organization. 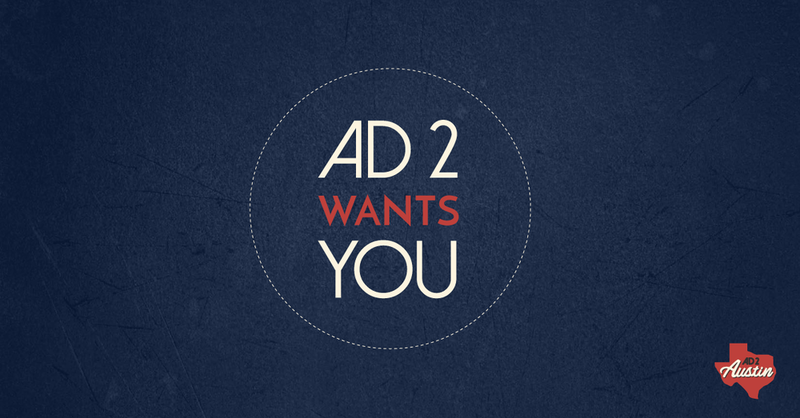 It's a great way to network with companies and get them excited about supporting Ad 2. Our Sponsorship committee members are able to make money (commissions) on the cash sponsorships they acquire. Club Achievement: This committee is in charge of ensuring the club and its respective committees document their efforts in preparation for submitting (eight!) Club Achievement Books each year. This role is crucial! It is the only way for Ad 2 Austin to keep itself up and running. Government and Industry Relations: This committee leads the development of projects, programs, and communications designed to build effective relations with local, state, and federal governments. Members strive to initiate favorable legislation, contribute to the defeat of adverse legislation, educate lawmakers, and promote industry self-regulation. Diversity: Austin is a diverse community, and it's important we embrace, support, and empower our differences. Co-chairs and committee members will ensure diversity is always at the forefront of our minds. This is a great opportunity to develop a content series that educates the Austin community on the importance of diversity, what diversity looks like in advertising and marketing, and ways we can improve it. If you see a fit, send us an email at president@ad2austin.com.